There is no doubt that the decade of 2010 was a ‘Mobile App Revolution Decade’ due to the increasing popularity of Android and iOS. Also, the average number of apps submitted by the developers and app development companies at the Apple App store are around 1000 per day. Experts calculation is that there would be more than 2.15 billion smartphone users worldwide in 2016, and this figure alone answers the fact that mobile app development would be one of the most fascinating things to witness. In the post, we are going to take a look at top 10 gripping mobile app trends for the coming year, starting with App Security. According to a Gartner report fore-casted, More than 75% of mobile apps will fail basic security measures through 2015, and this critical issue kept the developers on their toes throughout 2015 and possibly to remain their first focus in 2016 as well. So, if you want your mobile app to dominate the stores successfully, then you do not ignore the security defects. If the programs do not follow out strict security protocols, then the highly sensitive information of users such as SSN (Social Security number) or bank details become prone to hacking, and this is a big concern for the developers. Cloud technology will continue to play an important role in mobile app development in 2016 because of an upward shift in the use of mobile devices. Also, about 43% of app developers who create enterprise apps will make more than $10K per month. There are plenty of benefits if this technology, for example, developers can use it to retain the small size of the apps, can manage bandwidth or different memory issues. In addition to its benefits cloud compatibility lets people to sync their apps across various smart devices. Apple at present offers over 10,000 apps to their Smartwatch users and this figure is going to crawl up to three times by the end of 2016. So, developers are going to have a great time in the future. The Global Positioning System (GPS) has become a self-loading command for in-door mapping and provides rise to the beacon and location-based WI-Fi. Also, WiFi is mostly used in hotels, retail, restaurants, and in health care. It can be used to provide people with relevant information to close to where they are standin. Users want to know more about the working of beacons and WI-Fi in indoor positions. Beacon services will broaden the possibilities for location knowings as well as will give different chances for interaction with potential customers and clients. One of the hottest topics in tech is wearable Technology was and consumer electronics, Thanks to Apple Watch. Until now apps for wearable devices were mostly focused on health care and fitness industry, but these devices is expected to be used by enterprises to boost their productivity and efficiency with the starting of 2016. Many fashion and textile industries are also thinking to adopt wearable technology in the coming year. Also, mobile app developers will be transferring their focus to more on wearable applications rather than smartphones for organizations and various industries in 2016. Do you know that over 65% of the businesses and organizations that want to increase productivity expect to invest in apps? There are more than 1 million apps in the App Store and Play Store, but enterprise apps have won more traction among all. About 25% of the app developers are now targeting enterprise apps. Also, app developers who create enterprise apps are making more than $10K every month compared to consumer app development. It is safe to take for granted that iOS and Android will continue to dominate the market in the 2016. Both are the big giants in the mobile OS market. Android has 82.8% of the market share at Q2 of 2015 and iOS at 13.9% or Windows at 2.6% as per the research figures of Firm IDC (Integrated Data Collection), and the rest of the 0.7% market share is divided among all the other OSs. So, both the mobile giants will rule not only the mobile markets, but the minds of the users too. “IoT will grow by 31.72% (CAGR) between 2014 and 2019” Technavio predicts. Also, more than 5 billion people and over 50 billion things will be connected to each other by 2019. Statistics like these clearly point out at the crucial role The Internet Of Things is going to play in 2016 and many coming years. IoT is taking mobile app development to a new level. Swift, the big programming language of the future is getting a lot of attention from developers. It is designed as an application language as well as a systems language, and provides developers the opportunity to write reliable code right from the very beginning. Swift is not going to replace Objective C as Integrated in Xcode, but will be way quicker. Today, about 80% of the total apps are free to download and this number would rise to 93% by the second quarter of 2016 as per the Gartner report. However, the major revenue generation model for the app owners would be in-app purchases. Besides, the number of mobile apps, including iOS and Android would be around 310 billion by the last quarter of 2016. So, no doubt about this hybrid app will rule the space. Mobile app development service companies will start focusing on faster app development as the competition is growing day by day, as a result shortening the ‘ideas-to-apps’ development cycle of course, without compromising on the quality of apps in any way. Also, Technologies like ‘just-in-time’ (JIT) with a ‘Quick-To-Market’ approach will grow in popularity. Some of these trends have already gained momentum while others are making a steady progress. 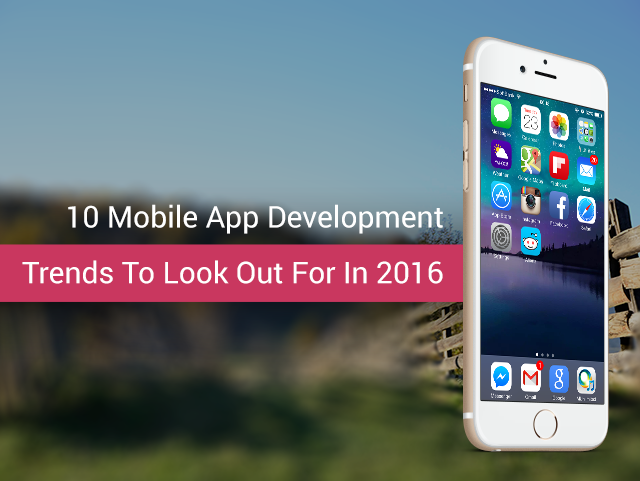 But without doubt they are going to make an important mark in the mobile app development picture in 2016 and beyond.